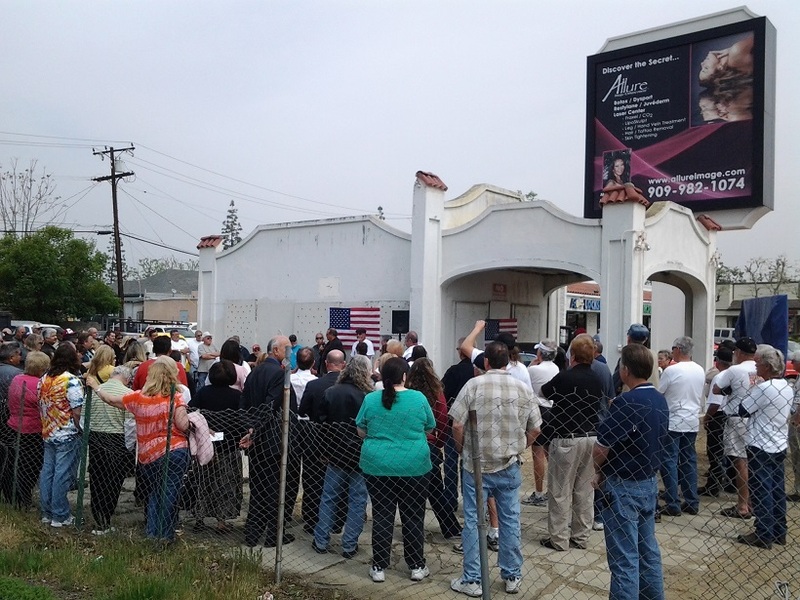 Sunday’s column is about last week’s State of the City luncheon in Upland, in which the typical dullness of the speech was punctuated now and then by humor — generally involving me. Friday’s column plugs my film series at Ontario’s public library during April, consisting of four Hitchcock classics. The schedule: “Saboteur” April 4, “Notorious” April 11, “North by Northwest” April 18 and “Psycho” April 25, all screening at 6:30 p.m. at the library, 215 E. C St. Admission is free. Have you seen any of the above? Do you quibble with my choices? (See the end of the column for my rationale.) Any thoughts on Hitchcock or his movies? When Ontario officials told me (upon the opening in December of the first licensed tattoo shop within city limits in recent memory) that they didn’t believe there had been a tattoo parlor since the 1950s, I was skeptical and made sure not to treat that as fact. 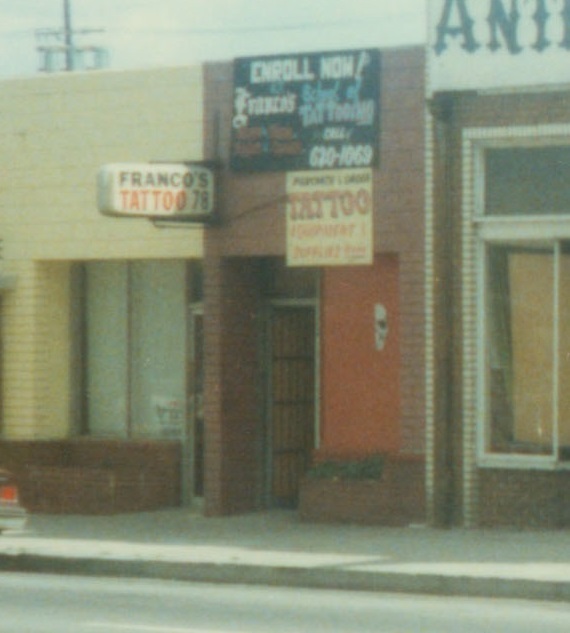 Good thing, because two readers soon contacted me to say that a man named Franco had a tattoo shop on East Holt Boulevard, two blocks east of Euclid Avenue, in the late 1970s-early 1980s. Note that this puts his shop within blocks of both City Hall and the Police Department, so if he was hiding, he was doing so in plain sight. One reader said she got her second tattoo there circa 1979. (She asked me not to use her name because “my mom would cringe if she read that as she still hates my tattoos!”) Another said Corey Miller, now of the Six Feet Under tattoo shop in Upland, apprenticed at Franco’s. Wednesday’s column is about Monday’s council meeting, where after a spirited debate, council members decided to grant members of the public four minutes to speak from now on, up from the current three. You can’t say the Upland City Council never gave you anything. As I was pumping gas, a hapless man was hitting up customers for “50 cents or a dollar” for gas. The driver in front of me claimed he had no cash, just cards. He was driving a Lexus SUV. Despite my refusal to make eye contact in hopes he would pass me by, the man asked me for money. I stopped cleaning the windshield of my battered Corolla and gave him a dollar. Make that $37.55 to prop up Upland’s economy. Google Street View now in some cases allows interior views of shops, as in the case of Some Crust Bakery in Claremont. 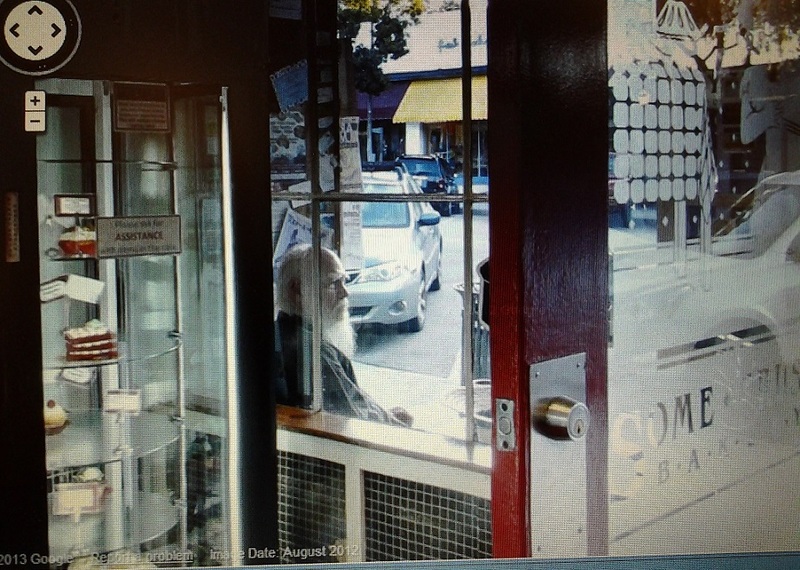 And as reader Gavin alerted me, to my astonishment, the panoramic view of the otherwise-unpopulated shop reveals a familiar face seated at his favorite table outside: Ray Collins, the singer, Mothers of Invention co-founder and Village habitue who died in December. The fine print on the image says it was shot in August. For those of us who miss him, it’s nice to think that in cyberspace, at least, Collins is still parked outside Some Crust with a cup of coffee. Sunday’s “King Kong” screening in Pomona drew some 400 people, making it one of the better-attended movie screenings at the Fox since its 2009 reopening. 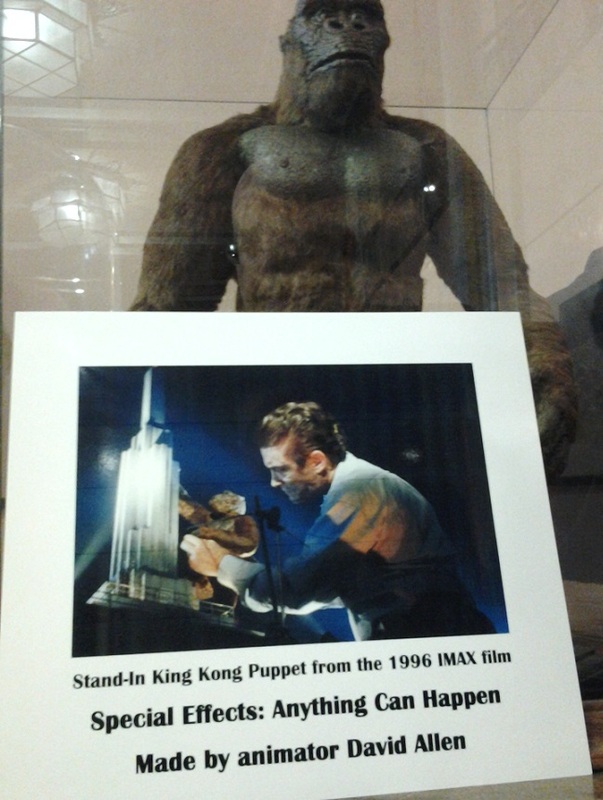 Below is one of the lobby displays, a Kong figure made by a 1970s animator named David Allen. Heh. 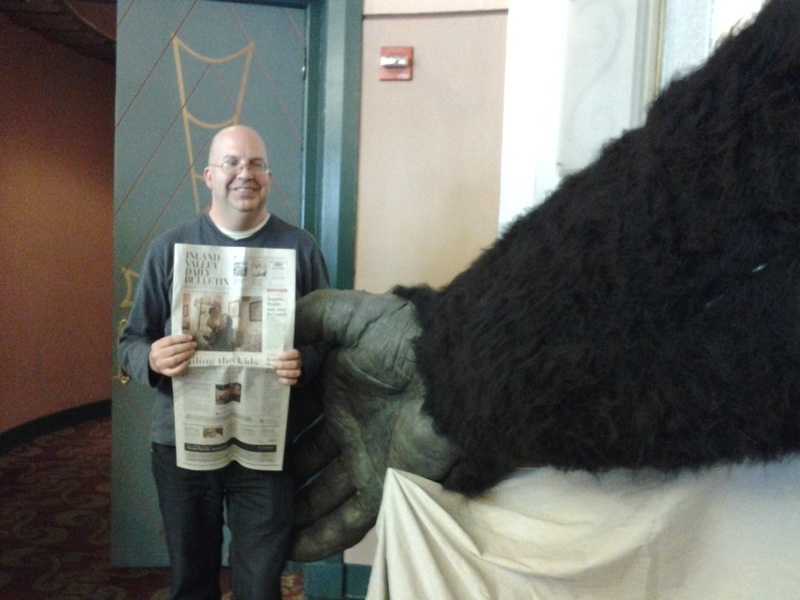 Above is a Daily Bulletin on Vacation-styled photo with a Kong arm that was likewise on display in the lobby. Kong had climbed with me to the top of the Fox tower, beat his chest, taken a swipe at the Pomona Police Department helicopter and then put me back down gently in the lobby, but alas, no cameras were present for the earlier feats. What became of that old King Kong? As mentioned here already, the crowd in that 1933 King Kong photo presented here and in the newspaper the other day was pasted on from another scene entirely, way back when (sigh). Sunday’s column explains more and also offers the fate of that King Kong head. 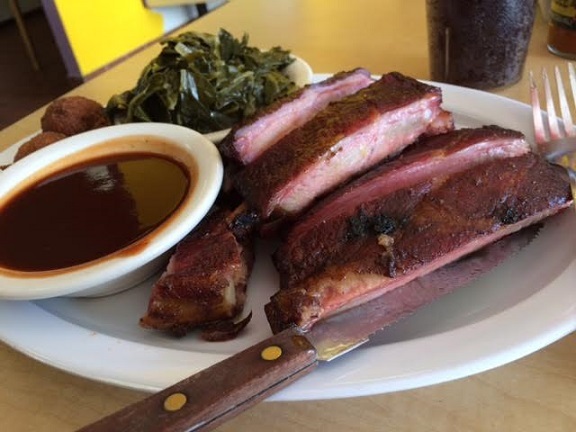 I also recount a dual-trip Metrolink weekend of mine and serve up a few valley vignettes. Like Market World, the Korean market chain that occupied this old Alpha Beta (and later IGA), the similarly Asian-grocery specialist Island Pacific Market has a small food court. Having never dined inside a supermarket before, I invited a friend for lunch. The main food stall is a Filipino buffet, and there’s also a small dim sum stall. A couple of other spots are vacant. The market only opened in November. 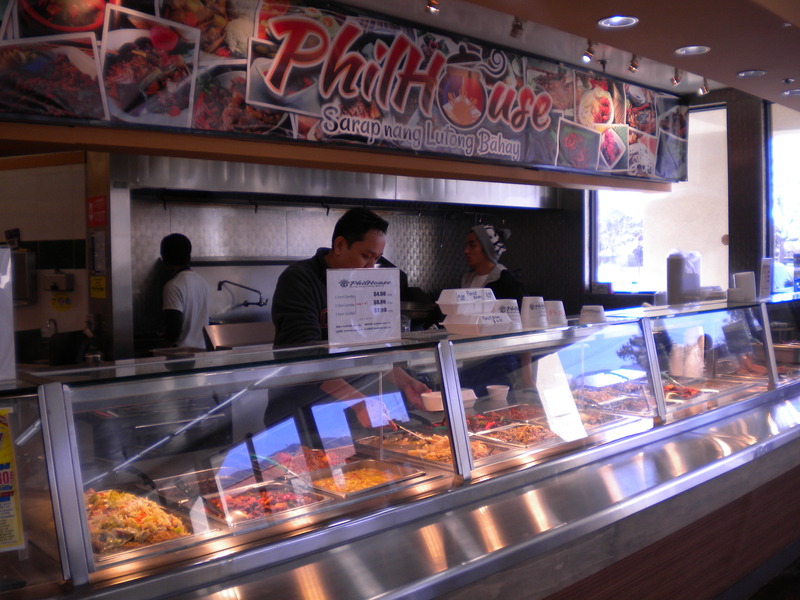 We lined up at the buffet, named Phil House. (Presumably no relation to reader Bob House.) It’s a little like a Panda Express: If you want a combo of one or more items, they grab a styrofoam container that already has rice in it and will add whichever items you request. 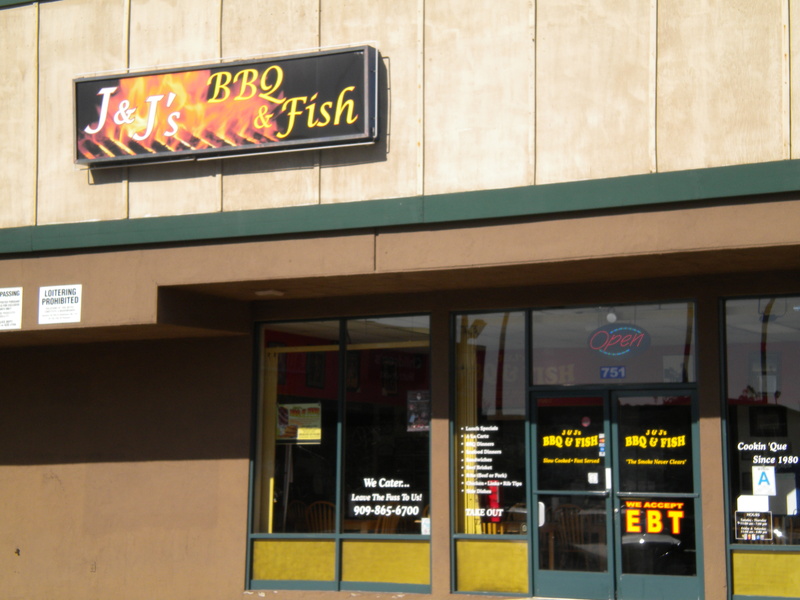 They had various pork, chicken, beef and seafood items, including barbecue skewers, and soups and stews. Other than an eggplant dish, we didn’t see any vegetables. Nothing is labeled, but we asked about various items that looked appealing. 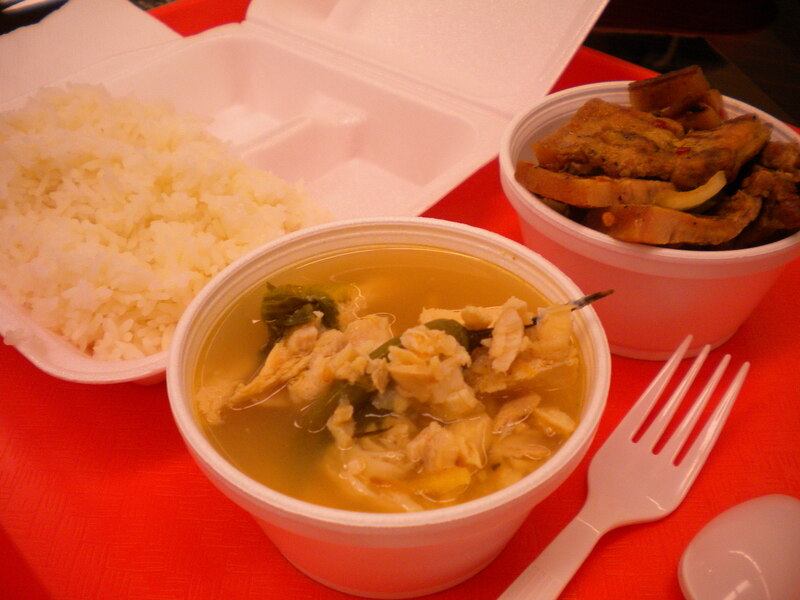 I had a pork dish and a soup with fish ($6, pictured below). 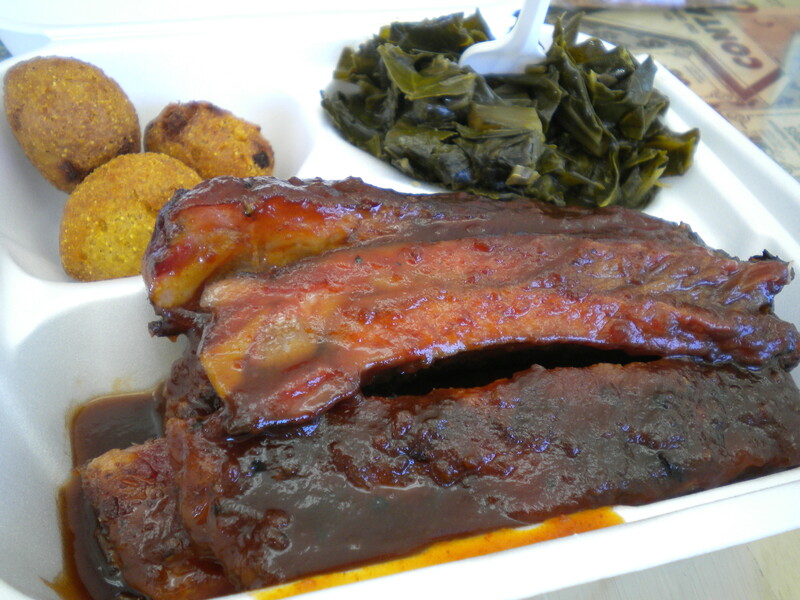 My friend had a different pork dish and some kind of barbecued fish. No way you’re going to duplicate our order because even we don’t know what we had. We sat in a nearby roped-off area of tables and chairs near the other stall. My grilled pork was tasty and the sauce at the bottom, flavored with onions and peppers, was great with a little rice mixed in. The soup, a broth with chunks of whitefish, was also enjoyable. My friend liked his fish (even though he had to pick out all the bones) and his other dish. His wife arrived and got steamed buns from the dim sum stall. I had a pork bun (price unknown), and that was good too. The staff could be seen making them in the kitchen. About the only place I ever get steamed buns is the Famima in Union Station, and as you’d expect, these were better. 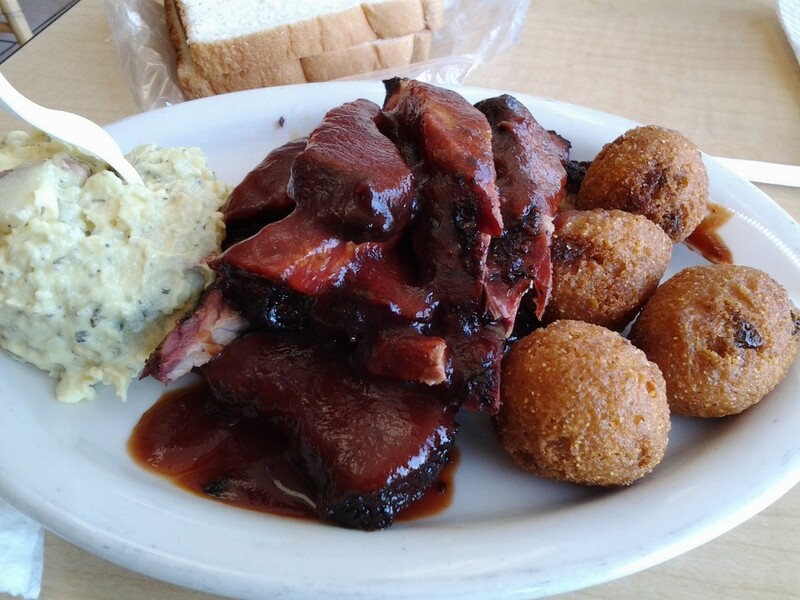 So, yes, you’d be eating inside a supermarket, but the food was good, fresh and cheap. Even if it might not have catchy names. Plans are in the works to renovate the 1920s Richfield service station on Foothill Boulevard (the old Route 66) at Archibald Avenue in Rancho Cucamonga and turn it into a museum and visitor center. 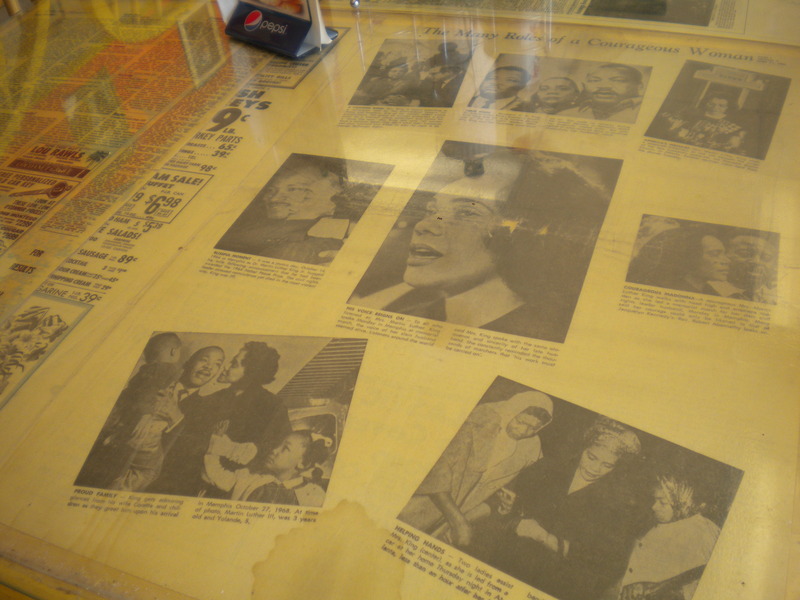 That’s the leadoff item in my Friday column, followed by items from around the valley, plus two news items from the Rancho Cucamonga library. The scene above is from Wednesday’s kickoff ceremony.